MW Mobile Blog: Mea Culpa - Sharp Park, blogging, unintended consequences and strange bedfellows. Mea Culpa - Sharp Park, blogging, unintended consequences and strange bedfellows. 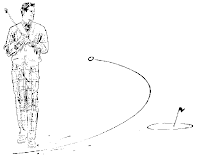 You step up to the tee, visualize the shot, pick a target line, carefully take a balanced stance, address the ball, adjust your grip, take the club back low and slow, maintain the triangle established by the arms and chest, keep the left arm straight, head tilted slightly to the right and behind the ball, transfer your weight to the right foot, wind your body like a spring, club poised at the top of the swing parallel to the ground, pivot around a stiff spine, shift your weight to the left as arms, shoulders, hips, and club come back to square in perfect symmetry while you accelerate the club head right through the center of the ball.... and snap hook it into the next county. Things don't always happen as you expect on a golf course. This also applies to politics. Last July I read an article in a local paper reporting that stimulus funds would be used to bring recycled water to Sharp Park. I was already tracking Supervisor Mirkarimi's capitulation to the intimidation tactics by the Center for Biological Diversity, and thought it odd that no one was putting the stories together. The fact is, if the rest of the SF Supervisors went along with Mirkarimi, this would be a pipeline to nowhere. So I wrote this blog post, cross-posted here, and referenced it in comments in newspapers. I took my own advice. I contacted everyone on the list. When I received any response at all, it was a form letter. A useless exercise, or so I thought. That last link on the list was an afterthought. It was to the office of Senator Tom Coburn of Oklahoma. He was soliciting examples of potential wasted stimulus funds after the release of his first report on the subject. I sent him the Sharp Park example and forgot about it. Fast forward six months... last week Senators John McCain and Tom Coburn released the second 2009 Stimulus Checkup, highlighting 100 wasteful stimulus projects. And what to do we find at number five? "Common sense dictates that a pipeline project to irrigate a golf course should not proceed if the golf course is to be closed. 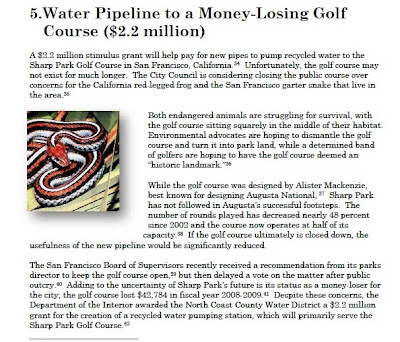 If there is no commitment by local, state, and federal leaders to the continued operation of the beneficiary of the pipeline (the Sharp Park Golf Course) the stimulus funds should be redirected. Again, this pipeline project is a good "shovel-ready" project that will help the community, create jobs, save water, and is a good use of stimulus funds, if there is a commitment to the Sharp Park Golf Course. So - what will it take to get that commitment... I will do what I can to put a spotlight on the potential of funding a "Pipeline to Nowhere." Faced with public embarrassment, public officials will generally take the path of least resistance. In this case that path is a simple rational common sense solution - Commit to the continuation of the Sharp Park golf course." "Speier said that McCain and Coburn have deliberately conflated\the debate over the future of the course and the recycled water project, which will create 275 jobs and irrigate some high school playing fields in addition to the golf course — all while conserving about 50 million gallons of potable water each year. "This golf course is not going away. This is a classic example of trying to make half-truths make your case," she said. "The senator from Arizona probably has the highest number of golf courses per capita in his state. I'd like to ask him how many of his golf courses are irrigated with potable water when recycled water is more efficient." Ya gotta love Jackie Speier. Nancy, Diane and Barbara remain MIA. These are federal taxpayer funds for and from their constituents. Watching those funds are part of their job. Lets state the obvious one more time. There is no waste, there is no problem, we get the funds, we get the jobs, and we save Hetch Hetchi water, only if the San Francisco Supervisors commit to keeping the course. Simple. "So let's see if we can follow the logic here . . . Brent Plater the environmentalist floats some lies that 2 Republican Senators cite to accuse the Obama Administration of wasting the taxpayer money, which Plater is more than happy to cite in his endless campaign to destroy the golf course. Politics does make strange bedfellows, but we think Plater may be catching his own disease this time around. "Hey, if you need to quote John McCain to support your failing cause, it's time to reassess and admit defeat." "Brent had a great opportunity to declare victory with the results of the study but got greedy. He still wants it all." "Brent has now made the issue about him, and him alone, unfortunately for all involved." "So now Brent Plater wants John McCain to make decisions about the golf course, and he objects to the use of recycled water there? Is he listening to himself on playback at all?" If the San Francisco Supervisors vote to keep the course, there are no wasted stimulus funds.